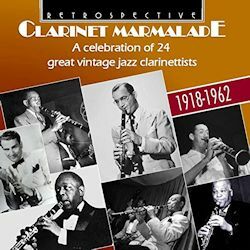 Clarinet Marmalade or ‘From Larry Shields to Acker Bilk’. Either way, this traditional clarinet compilation serves up what it calls a cavalcade of 24 masters of jazz history, though given the geographical origin of the label three British players have slipped into the pantheon. It would be nice to hear the Original Dixieland Jazz Band’s London Columbias or the rarer Vocalions for a change, as opposed to the New York Victors, but given that their tune, a Shields co-composition with pianist Henry Ragas, lends the CD its title, one shouldn’t be too fussy. Leaping a decade to Johnny Dodds is no hardship, his piercing blues-drenched New Orleans style a perfect fit for his trio performance, with Lil Armstrong and Bud Scott, of Clarinet Wobble. Earl Hines liked Omer Simeon’s slippery Creole lines and Beau Koo Jack is something of a classic – another trio performance, a medium well suited to the chamber jazz intimacies of the clarinet –even if hearing the two men together is like listening to a tea clipper being passed by a frigate: times were changing, and Hines ushered in the virtuoso era in jazz. It’s good to hear Tommy Dorsey all the way in Praying the Blues and the ever-influential and articulate Jimmy Noone, who’s helped out with some good breaks by little-known pianist Frank Smith on the 1937 Decca I Know that You Know. Chicagoan white jazz is headed by Frank Teschemacher and the Cellar Boys (Manone, Freeman, Wettling et al) in 1929 and their Wailing Blues is notable for Charles Melrose’s accordion, which turns the thing into a Blues Musette. Bud Freeman returns for a track with Condon in which Pee Wee Russell does his best bluebottle-in-a-jar impersonation - itself derived stylistically from Teschemacher – before we move on to the lovely tone and superb ideas of Irving Fazola with Bob Crosby’s Orchestra and the obvious figure of Goodman with his quartet. After Buster Bailey’s virtuoso arabesques on a rather tasteless Tiger Rag rehash called Man with a Horn Goes Berserk (amen to that) – during which Frankie Newton and Pete Brown twiddle their musical thumbs – it’s on to Bigard and the Duke on the relaxing A Lull at Dawn. Inevitably Bechet’s Blue Horizon is here but it’s good to hear Jimmy Hamilton (pre-Duke in 1941), with Teddy Wilson, the effervescent Artie Shaw with fantastic solos from Hank Jones and guitarist Joe Puma, and Matty Matlock, elegance personified on When it’s Sleepy Time Down South. There’s Edmond Hall to admire, a live Albert Nicholas in Copenhagen, Pete Fountain in LA, George Lewis’s Burgundy Street Blues (the Atlantic version from 1961) and the trio of British players – Sid Phillips – hugely underrated – Acker and Monty Sunshine, the last named with Barber in – no, not Petite Fleur but Wild Cat Blues. This is an enjoyable, not wholly predictable selection of players: you can fight with the compilers if your favourite is missing (Sidney Arodin, Willie Joseph, for me – you’ll have your own players) but you’ll nevertheless enjoy the selections, booklet notes and good transfers.